Two of my favourite art forms are uniquely American - jazz and comics. And one way to articulate my enthusiasm for the work of comics legend Jack 'King' Kirby is through talking about jazz. Specifically, jazz in 1959. In that year, an album was released that changed the face of music. Kind of Blue by Miles Davis is a beautiful, spare, and understated masterpiece, as So What continues to make clear. In comics, the equivalent might be the work of Alex Toth, who never drew a line that wasn't essential to convey his intent - look here for some of what Toth was doing in 1959. Every line is about telling the story, nothing is superfluous. 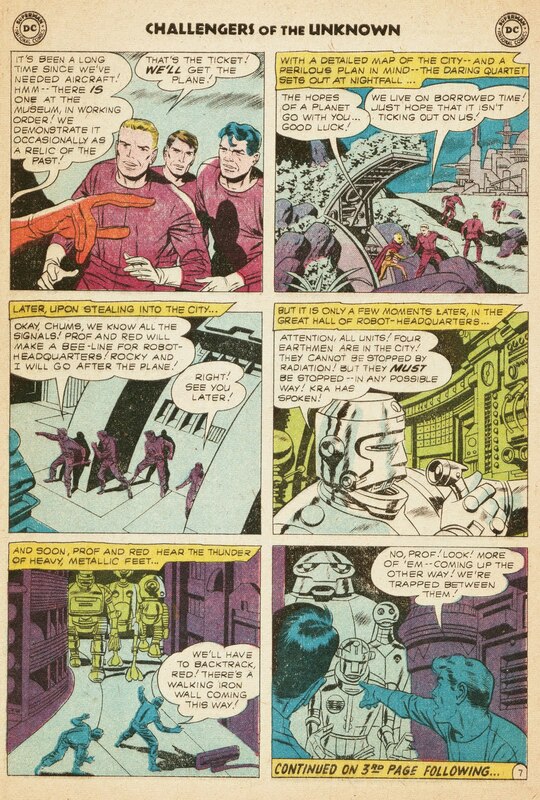 Compare to what Kirby was up to in the same year - he tells the story, but he's captivated by the chance to add detail. Each robot gives him a chance to come up with a new design, and the tech in the background is guaranteed to get a child's mind wondering just what function the switches and buttons have. It's every grown up's caricature of what comics are and why many wouldn't let their children read them, an explosion of grotesque imagination by an uncensored mind. Kind of Blue is celebrated still. Rightly so - it's a thing of rare beauty. Just as highly touted at the time was the record Ah Um by Charles Mingus. It blares, it stomps, and people whoop and clap - where Miles transforms jazz into something elegant, Mingus is fascinated by its roots in churches and brothels, brandishing them while at the same time bringing different kinds of sophistication than those Miles was then fascinated by to a sometimes raw setting. Mingus isn't talked about much these days. He's one for the connoisseurs. Something similar has happened with Kirby in some respects. His style went out of fashion at some point in the seventies, and many artists took pride in doing more 'realistic' illustration. But by then Jack Kirby had already created pretty much all the building blocks of what went out under the Marvel name. The Hulk. Captain America. Fantastic Four. Black Panther. X-Men. Thor (in his comics incarnation). Ant Man. Silver Surfer. There are at least a hundred other characters he created for Marvel alone. Even if you don't follow comics, you'll know those characters, because of the films which they appear in. Sadly, Kirby never got to see the full impact he would come to have on popular culture, and was treated very badly by Marvel, who only now after his death are acknowledging his significance. Without him, Marvel would have a lot less to offer the world. 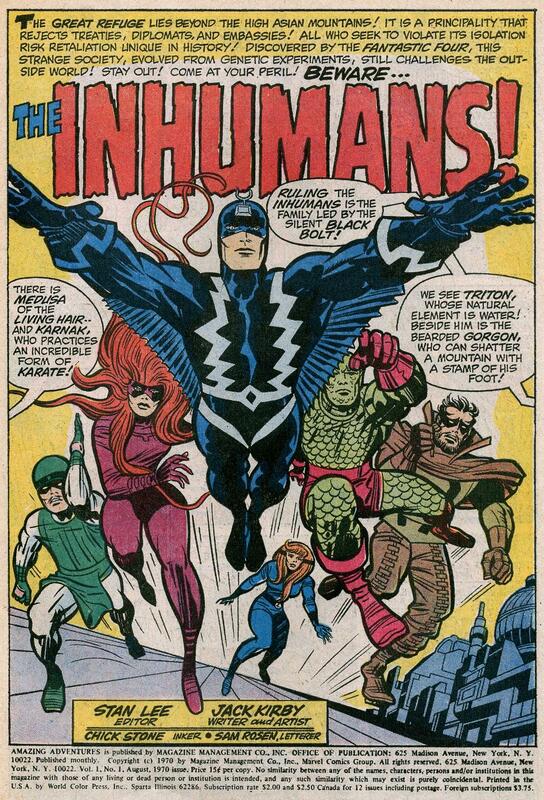 Very few of their characters post-Kirby have taken off, and the publisher is now trying to persuade fans to be charmed by a reinvented version of Jack's creations The Inhumans despite none of the new characters having anything like the kind of weird visceral charm that Jack's originals have. Jack Kirby would have been 99 this week. He was never remotely rewarded for his work in creating the multi-billion dollar enterprise that his characters have spawned. And that may yet be one of his biggest legacies to creators such as myself who want to create work in comics and other media, and to do so on terms that respect our ability to devise concepts that appeal to audiences and generate income as a result. Charles Mingus never had to deal with the consequences of vast popularity, but Miles Davis did. He signed with Warner Brothers in 1986, and the contract meant they owned his publishing rights. As a consequence, Miles didn't write new material since he didn't feel he was being compensated suitably, and the reputation of his last few records - written by collaborators - suffers because of that choice. It's one Miles made knowingly and in strength - better that perhaps than to die with little of the recognition that's since come to him, which was Kirby's fate. At least Jack's estate reached an agreement with Marvel, so his family get to enjoy the legacy the artist deserved. Treating creators fairly is a big subject, and it's got lots of facets. Kirby found he was treated a lot better in the world of animation than he ever had been in comics, and they're both worlds that I'm now beginning to be active in. It's thanks to creators like the ones mentioned in this piece that my generation of writers and artists are in a much better position to be rewarded for what we develop than our predecessors. We face different difficulties too, as audiences are used to getting what they want for free online from digital providers happy to let people have content while claiming to have no legal obligation to recompense its creators. There will always be a new battle, a new frontier for creators in their imaginations and their ability to prosper. I can only hope that I face mine with even a fraction of the imagination and energy that Jack Kirby did.